This spunky Scottish canine knows she's the hottest ticket in town—just ask her. Described as "insanely" cute, the West Highland White Terrier, or Westie, is one of the most popular small terriers. This nonstop tail wagger recalls a stuffed toy, endearing her to anybody who looks. But her looks can be deceiving: the Westie was bred centuries ago to hunt rats and other vermin, and as such should never be underestimated: she's a surprisingly hardworking, plucky little dog, a valiant huntress crammed into a wee Scottish package. Coat - The Westie's two-inch coat is hard to the touch—never fluffy—but with a soft undercoat. The somewhat longer coat on the back is trimmed to blend smoothly with the shorter coat at the shoulders and neck. Considerable hair is left to frame the face, giving the Westie her characteristic "dish"-shaped face and disarmingly appealing expression. And as her name suggests, the only acceptable color in a West Highland White Terrier is solid white. The West Highland White Terrier has a broad head slightly longer than her muzzle, appearing round as viewed straight on because of her grooming. The Westie's head is well proportioned to her body, with powerful jaws and a black nose and lips. Her medium-sized, piercing eyes are dark brown, gazing out from under heavy eyebrows. Her ears are small, erect, and set wide apart near the top of the skull; they are never cropped. She has a deep chest, a straight back, and powerful hindquarters. Her muscular neck is not overlong, set on sloping shoulders. The Westie's legs are straight and covered with short, hard hair; her forelegs are set in under the shoulder blades so that her body overhangs them. The body between the withers and the root of the tail is slightly shorter than the height at the withers. The Westie has a carrot-shaped tail, never docked, and never carried higher than the top of her head. Her distinctive gait is powerful, with reach and drive. In short, the West Highland White Terrier is a compact but well-balanced and confident dog, hardy looking and strongly built. The West Highland White Terrier, the Dandie Dinmont, the Skye, the Scottish, and the Cairn Terrier are all variants of the same breed. The Westie got her start in Scotland hunting various quarry, including fox, badger, and otter, and killing rats and other vermin. The exact origin of this breed is unclear, but some hold that it is traceable to a small breed of earth dogs that James I of Argyllshire gifted the king of France in the 18th century. The dog's white color is said to have resulted after a tragic fox hunting accident, when Colonel Malcolm of Poltalloch inadvertently shot and killed one of his beloved wheaten-colored Cairn Terriers; to prevent such tragedies in the future he set out to breed only white dogs that could be distinguished easily from foxes in the field. While the Westie has been known historically as the Poltalloch Terrier and the Roseneath Terrier, the Kennel Club of England officially recognized it as the West Highland White Terrier in 1906; the American Kennel Club followed suit in 1908. The Westie boasts a long list of winsome traits: she's alert, happy, curious, smart, loyal, entertaining, and self-reliant but friendly. She loves people, and travels well, owing to her compact size. She is not pushy or temperamental, and does not make unreasonable demands. She can be mistaken for stubborn after being given a command she fails to execute, but in truth is more interested in her reward: she'll do your bidding if the prize is attractive enough. Are West Highland Terriers Good with Kids? Emphatically yes, but especially with older children. Are West Highland Terriers Good with Other Pets? The Westie generally gets along well with dogs she encounters in public (the exception to this is an encounter between an intact male Westie and another intact male dog). She coexists happily with other family dogs, and can learn to tolerate the family cat, although she may give chase on occasion. But because of her hunting heritage, she will prey upon other small household animals who run free, for example, rabbits or gerbils. Are West Highland Terriers Good Guard Dogs? The Westie alerts her family to visitors, the mailman, other dogs passing by the house—just about any suspicious movement gets a reaction from her. You may need to train some of the barking out of her, in fact, to make living with her a bit less noisy, but take heart—you can train her to bark only once as an alert, and then to simmer down. The Westie is a medium-energy dog, but is "quick, curious, and lively." Some Westies enjoy digging, although this is thought to be an acquired trait; training can stop it. She can bark a bit too much, but training can curb this habit, too. The proclivity to chase small animals is hard-wired—you'll never train this out of a Westie. Indoor The West Highland White Terrier is an indoor dog through and through, but adaptable to city or country life. She makes a good apartment dweller if she has opportunities for regular walks, and if you train her to be quiet. The Westie makes an excellent first dog for the novice owner. Outdoor While Westies should never be asked to live outside, they enjoy playtime outdoors, and in fact, often transform into high-energy sizzlers in the backyard or at the dog park. Give your Westie ample opportunities to play fast-paced games with you outside. Exercise A Westie can most likely enjoy life as a couch potato (although not as your lap dog), but also enjoys an energetic play session with a squeaky toy as much as the next dog; she'll put on a show complete with silly antics that prove entertaining for anybody watching. Westies do not require as much exercise as a large breed, a Lab, for example, but your Westie will enjoy one or two daily walks, and even a quick game of fetch with a toy tossed down a long hallway can satisfy her fairly minimal requirements for exercise. Endurance While she's not celebrated for her longevity in the field like a sporting breed, the Westie has energy in spades and will chase balls (inside or out) and engage in other types of play for hours. 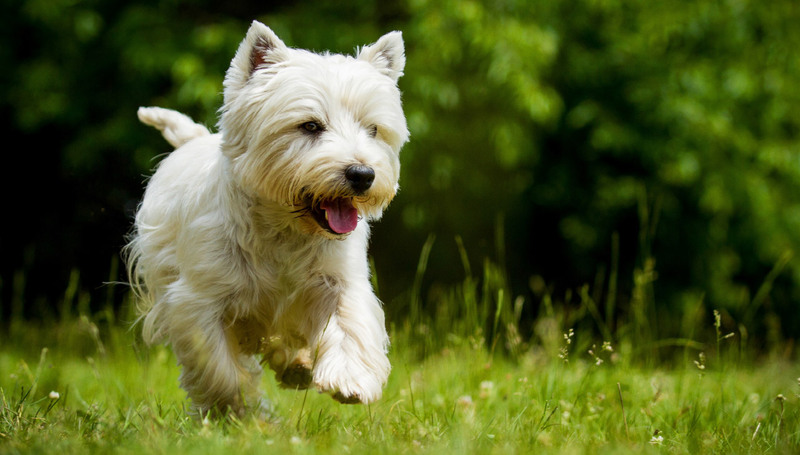 Running Miles: Westies have been known to run as much as a half marathon, or just over 13 miles. While this is exceptional, a Westie should have no trouble keeping up with you on your daily maintenance run once she's conditioned to it. And if she runs off-leash, she'll probably cover more miles than you with her proclivity to tirelessly run out and then circle back. Hiking Miles: Westies easily make the cut for best small hiking breeds lists, and can handle hiking four miles or more daily with aplomb once they're conditioned to do it. Food Most West Highland White Terriers thrive on about a cup of high-quality dry kibble daily, give or take, divided into two meals. But how much an individual Westie needs depends on her size, age, build, metabolism, and activity level. Consult your vet for help fine-tuning your Westie's diet. Alone Time The Westie is first and foremost a companion animal. But because of her independent streak, she'll tolerate being left alone fairly well, so long as she has access to her favorite things—an entertaining toy, perhaps the television or radio tuned to her favorite channel, and a delectable frozen peanut butter treat inside her cozy crate. Because of her distinctive look, the best grooming strategy is to take your Westie to a professional groomer about every four to six weeks. Her coat sheds only seasonally, but requires daily brushing and combing. Westies have a naturally dry coat, so avoid over-bathing; your affable Westie will enjoy the attention and will most likely find bathing and grooming pleasurable. Brush your Westie's teeth a couple of times a week to reduce tartar buildup, and trim her fast-growing nails regularly. Check her ears routinely for redness or odor that indicates an infection; wipe them out with a cotton ball dampened with a gentle ear cleaner. Craniomandibular osteopathy, where the skull bones become abnormally large during a puppy's growth; it is thought to be inherited. Problems arising from this condition can be chronic and debilitating. Legg-Calve-Perthes disease, or disintegration of the femoral head; symptoms emerge when the Westie is a puppy, and surgery can usually correct the condition. Pulmonary fibrosis, also called Westie lung disease, where the lungs lose their elasticity from scarring in the air sacs and connective tissue. The prognosis is poor, but a successful outcome is more likely with early diagnosis. Patellar luxation, or dislocation of the kneecap. Patellar luxation can be painful and crippling in some cases, but in others the dog will lead a relatively normal life. You can minimize serious health concerns in a West Highland White Terrier by purchasing her from a reputable breeder who engages in responsible breeding practices, and through screening for common diseases and conditions. Ask your Westie breeder for health clearances from the Orthopedic Foundation for Animals (OFA) for hip dysplasia (with a score of fair or better), elbow dysplasia, hypothyroidism, and von Willebrand's disease; from Auburn University for thrombopathia; and from the Canine Eye Registry Foundation (CERF) to certify that her eyes are normal. Confirm her health clearances on the OFA website (offa.org). Because of her history as a ratter, the Westie has an independent streak that can make her seem difficult to train. But she is intelligent, a quick study, and responds well to basic obedience training with plenty of positive reinforcement and consistent expectations. Many Westies do well with 'clicker'-style training, with generous reward-based reinforcement. And because she prefers to be clean, the Westie is also fairly easy to house train. Westies can undertake training as therapy dogs, and also excel in tracking, flyball, agility, and obedience competitions. West Highland White Terriers perform exceptionally well on Earthdog tests, hunting vermin and quarry in underground dens. Westies Can Fit Into Tight Spaces (But Sometimes Get Stuck). It's true: the West Highland White Terrier is built to burrow, with her bullet-shaped body and thinner, heart-shaped thorax. But she's not one to give up when her prey flees into an ever-tighter tunnel, which can get her into trouble. It's thought the extra sturdy tail on a Westie was developed to allow a handler to yank the stuck dog out of a tight squeeze, although tail-yanking is not recommended—on a Westie or any other kind of dog. Westies (And Other Dogs) Can Get Sunburn. The Westie's ears, in particular, are covered in sensitive, pink skin. If you're headed on an outdoor adventure with your Westie in the sunshine, apply sunscreen first. Westies Possess a Loud Bark for a Purpose. It might drive you crazy to shush your Westie every time she alerts you to a twitching leaf on the lawn, but she comes by it honestly: that big bark was bred into her so she could alert her human handler to the presence of prey; it was also a handy tool to let the person know she got stuck in the hole going after the prey. The Westie Is a Celebrity. Aside from her accolades at renowned dog shows, including multiple wins at Cruft's in the UK and at the Westminster Kennel Club dog show in the US, the Westie has made a showing in television and film, including the animated show "King of the Hill" and the BBC series "Hamish Macbeth." She also appears as the coverdog for Cesar dog food, and shares the Black & White Scotch whisky label with a Scottie.